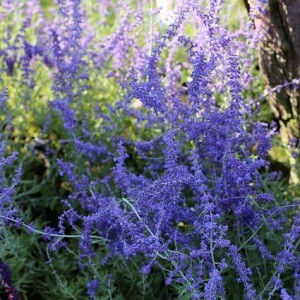 Perovskiya, or the Russian sage, represents a motley aromatic perennial grassy plant from the family of Laaminaceae. This plant grows in dry and stony heathlands of Afghanistan, Pakistan, Turkestan and the Himalayas. In height this semi-bush often reaches 150 cm, its width approximately same. Perovskiya stalks high and curved, their tops are topped with cones, each of which is entirely covered with the tiny florets of a gentle violet shade collected in magnificent inflorescences. Height of stalks varies from 40 to 120 cm. The blossoming bush of a perovskiya is especially fine – from a distance it reminds a lilac cloud, quite often a plant during blossoming confuse to a lavender. Blossoming of a plant begins in July and comes to an end to the middle of fall.